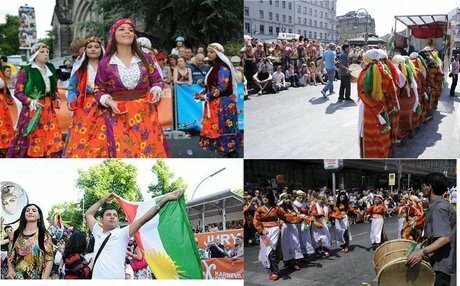 The 4-day cultural fiesta hosted a large-scale colourful Kurdish crowd who were enthusiastic to present their traditional music and dances. Home to the largest Kurdish population in Europe, Germany has been organizing the carnival since 1996, creating a platform of support for the country’s minorities to help them present and promote their cultures and traditions. Music and dances from the different parts of Kurdistan thrilled crowds at the annual Berlin Carnival of Cultures, which every year turns the streets of the German capital into a giant party. The four-day fiesta climaxed Sunday [24 May 2015], with hundreds of thousands turned out to enjoy the good weather and a parade with some 60 carnival floats, including from Kurdistan. The Kurdish Koma Dilan group was among the huge crowds with a repertoire of traditional music and dances from the different parts of Kurdistan. The festival, which started in 1996 for the first time, transforms the streets of one of the world’s most international cities into a platform for Germany’s minorities to display their culture through musical groups, bands and solo artists. Last year, some 1.4 million participants rubbed shoulders at the carnival. “The caravan turns the streets into Berlin's largest stage, questioning everyday life and politics through art and celebration,” said the carnival’s official homepage. Musicians played Kurdish drums and flutes while girls in brightly coloured traditional costumes put on a non-stop show of dances. A truck, decorated with a Kurdish flag in front, crawled among the crowds. Germany hosts the largest Kurdish community abroad. About 800,000 Kurds live in the European country, which supports Kurdish troops against the so-called Islamic State (ISIS) with weapons, military training and logistics. The Kurdish community in Germany is very active through different organizations and associations, like the Kurdish Youth Germany (KJD) or KOMCIWAN, another Kurdish organization. Representatives of KOMCIWAN were invited by German President Joachim Gauck to participate at a Bellevue Palace celebration to honour them for their excellent civic engagement.